The alarming growth of Islam around the world and especially in the United States is a subject of interest to all Christians. 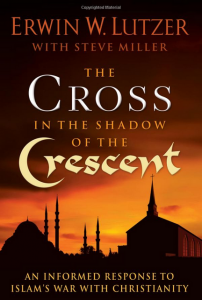 Lutzer does his usual good job of documenting the rise of Islam with its government of Shariah Law, the Muslim Brotherhood, and its goal of eventual takeover of the whole world in the name of Allah and the prophet Muhammad. Abdurahman Alamoudi, a top agent in the Muslim Brotherhood said, “I have no doubt in my mind, Muslims sooner or later will be the moral leadership of America. It depends on me and you, either we do it now or we do it after a hundred years, but this country will become a Muslim country.” This man became a naturalized American citizen in 1996 and founded the American Muslim Council (AMC) which has close ties with the White House and the US Department of Defense which granted him the authority to appoint Muslim chaplains in the US military through another organization he founded, The American Muslim Armed Forces and Veteran Affairs Council (AMAFVAC). This is just one of dozens of alarming circumstances Lutzer unveils. In addition, Lutzer drives home the Muslim philosophy of tolerance for intolerance. William Federer is quoted as saying, “If the West naively promotes tolerance of a belief system that does not promote tolerance, it is effectively promoting intolerance. If the West refuses to promote an intolerant belief system, it is accused of being intolerant.” Islam is purposely using the US Constitution of freedom of religion to eliminate all religions except Islam because all other religions want the freedom to co-exist peacefully, because that is their philosophy, while Islam wants the freedom to dominate all other religions, because that is their philosophy. I could go on and on. But you can read it yourself. A 2013 Harvest House book.